Gladwin Earl Bartel, 81, died peacefully on October 14, 2018, after living at Kidron Bethel in North Newton, Kansas, since 2007. He was born December 11, 1936, in Goessel, Kansas, the first child of Adolf and Olga Brandt Bartel. Sister Rosalie was born three years later. Gladwin grew up on a farm near Hillsboro, Kansas. Gladwin was baptized as a teen and became a member of Alexanderwohl Mennonite Church. Gladwin was involved with Future Farmers of America and played basketball, graduating from Hillsboro High School in 1954. Gladwin enrolled at Bethel College the same year he graduated from high school, and met Lois Franz her freshman year in 1955. Gladwin and Lois married at Menno Mennonite Church in Ritzville, Washington, in 1957 and moved to Smithville, Ohio, where they spent two years with Mennonite Central Committee Voluntary Service. They worked with boys who had troubled, delinquent histories. Gladwin supervised the care of a large garden project. 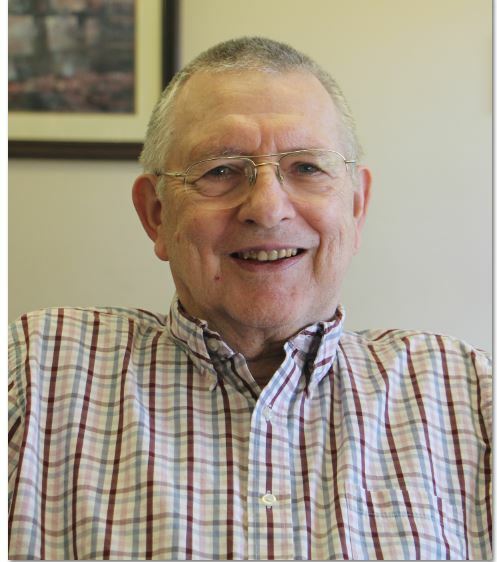 Gladwin and Lois returned to Bethel and he graduated in 1961 with a Bachelor of Arts degree in mathematics and began his teaching career in Newton schools. He received his Master of Arts Degree in mathematics from Kansas State Teachers’ College, now Emporia State University, in 1964. Their first son, Baron Craig (Barry), was born in Newton in 1962. In 1964 the family moved to Madison, Wisconsin, where Gladwin had a National Science Foundation scholarship to study at the university. Their second son, Kelvin Franz, was born in Madison in 1964. After that year the family moved to Washington State for Gladwin to teach at Whitworth College in Spokane and then to pursue further education at Washington State University in Pullman. Gladwin and his family moved to La Junta, Colorado, in 1970, where Gladwin was a Math and Computer Science Professor at Otero Junior College until his retirement in 2001. Professionally, he served on committees relating to the State Board of Community Colleges and edited and reviewed proofs for math journals. Gladwin was active in Emmanuel Mennonite Church in La Junta where, among other involvement, he chaired the “student aid fund” committee. In La Junta, Gladwin pursued several hobbies. He enjoyed camping and summer traveling as a family. He became an avid gardener, silversmith, and woodworker. He organized and pitched for his church’s slow-pitch softball team. He always stayed connected with his family farm, harvesting walnut and ash wood for woodworking and fires, and helping trim the trees. Gladwin and Lois moved to independent living in the Kidron Bethel retirement community in North Newton, Kansas, in 2007, and joined the Shalom Mennonite Church community in Newton. Gladwin enjoyed being closer to the family farm, and continued woodworking. Gladwin’s Parkinson’s, originally diagnosed in 1998, progressed and he lived the last four years of life in the nursing care unit. He died peacefully on October 14, 2018 with family near; in the care of Kidron Bethel and Harry Hynes hospice; and in the continuing embrace of God. Survivors include his wife Lois, of North Newton; two sons Barry and his wife Brenda of Golden, Colorado, and Kelvin and his wife Lisa of Newton, Kansas; four grandchildren Jordan and his wife Kaitlin of Hillsboro, Oregon; Leah Schwarz and husband Gregory of Overland Park, Kansas; Shaye of McPherson, Kansas; and Aubrey of Newton; one sister Rosalie Neufeld and her husband Robert, and two nephews Keith and Kevin, all of North Newton.